P0973. 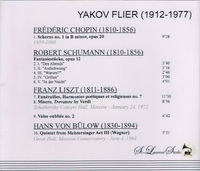 YAKOV FLIER: Chopin, Schumann, Liszt & Wagner-von Bülow. (Canada) St Laurent Studio YSL 33-094, recorded 1959-72. Transfers by Yves St Laurent. “The reputation of pianist Yakov Flier faded after his death in 1977, but recent interest in his recordings and career has somewhat revived his name. In fact, he was one of the leading Soviet pianists of his day and might have had far greater success internationally had Cold War politics not encumbered his career. Gilels, then Richter, and finally Lazar Berman were granted permission by Soviet cultural czars to concertize abroad, and so too was Flier. But, unlike that star-studded trio, Flier did not live long after he first appeared in the West. That said, he also played a significant role in limiting his performing career by devoting much of his energies to teaching, and by abandoning solo concerts for a whole decade (1949-1959). It is not surprising then that he made fewer concert tours than many lesser-known pianists and produced comparatively few recordings. Still, in the 1960's and '70s Flier managed to develop a conspicuous following in Western Europe and the United States, not to mention the Soviet Union. His repertory was rich in Romantics, favoring Schumann, Chopin, Brahms, Liszt and Rachmaninov, though it did include contemporaries like Kabalevsky. Flier's recordings were made for the Soviet label Melodiya. Yakov Flier studied piano at the Moscow Conservatory under the renowned pedagogue Konstantin Igumnov. Flier graduated in 1934 as one of the USSR's most promising keyboard prospects. He lived up to that hope: in 1936 he won first prize at the prestigious Vienna International Piano Competition, ahead of Emil Gilels.